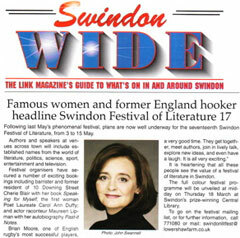 A co-conspirator draws Guido’s attention to Swindon Wide’s reporting of the upcoming ‘Swindon Festival of Literature’. Undoubtedly one of the cultural highlights of the year. Cherie will really have to prostitute herself somewhat to push her book, she got a reported £1 million advance and it has sold a mere 33,000 copies.